The dreaded vehicle inspection by the Officer Commanding! Note he has his swagger stick firmly placed under his arm. No doubt to be used to point out the deficiencies in cleanliness of a member’s police vehicle. One could imagine the grumbling that went on as the members washed and cleaned their police cars, which appear all very clean and shiny in the picture. I believe those are tire chains placed to the rear of each vehicle. Four vehicles in the rear on the left have roof mounted sirens of different designs. There are several plainclothes members wearing their required fedoras. One rebel, facing towards the camera, has no hat, but does have the required Mountie brush cut. No doubt badges, i.d. 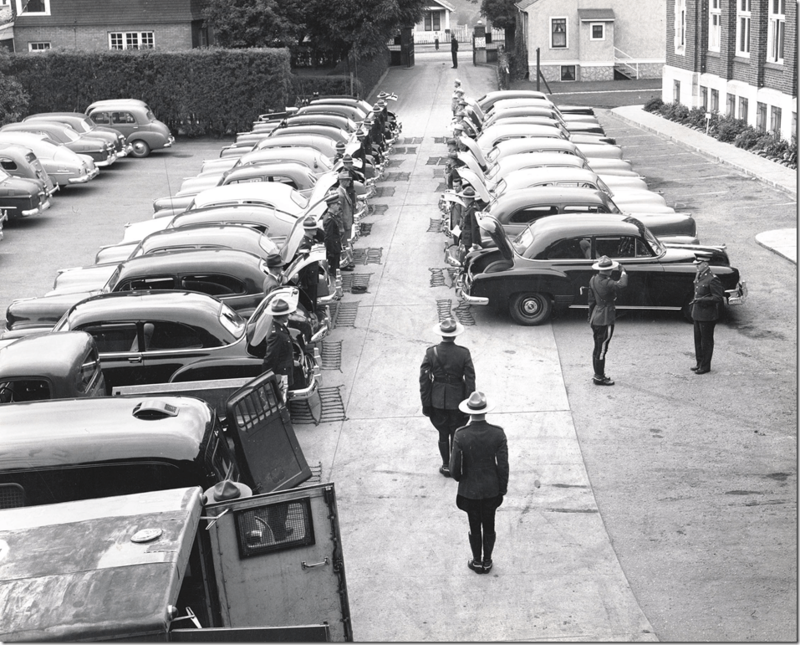 cards and revolvers had to be presented for inspection prior to or after the vehicles were inspected. Does anyone recognize the layout of the buildings? Perhaps, a Division HQs or Sub-Division HQs, could the small building by the lot entry by the O.C.’s residence? 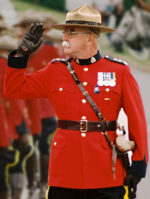 Photograph of retired RCMP Superintendent Ric Hall (Source of the photo – Ric Hall’s Photo Collection).